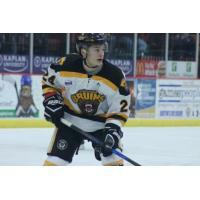 AUSTIN, MN - Evan Cholak played more games in an Austin Bruins uniform than any player before him. Now he'll trade his black and gold for green and white as he announced his commitment to NCAA DIII powerhouse St. Norbert College this week. Cholak, a '97-born forward from Kenosha, Wisconsin, first joined the Bruins in the 2015-16 season and had a solid rookie campaign, with 11 goals and 11 assists in 57 games. He added three goals and an assist in nine playoff games that season. In his second year in Austin, Cholak played in all 60 games, and became more of a playmaker, boosting his assist mark to 25, to go along with ten goals. This past season, the durable Cholak once again played all 60 regular season games, posting 20 goals and 29 assists. He added four points in seven postseason games. "[Holding the games played record] is an honor that I am very proud of but I could not have done it alone," said Cholak. "Our training and coaching staff really knows what they're doing and helped me stay healthy for the majority of my time with the Bruins." Throughout his Bruins career, Cholak has scored numerous highlight-reel goals, perhaps none more impressive than his Bobby Orr-esque move at the 2018 Top Prospects Tournament in Plymouth, Michigan. Playing for the Central Division on a line with Bruins teammates Andy Willis and Dante Zapata, Cholak cut across the goal mouth and flew threw the air as he tucked a backhand past Fairbanks Ice Dogs goaltender Josh Benson. "It was a really fun experience to play against all the top players in the league and I think it gave coaches a chance to see me play," Cholak said of the Top Prospects Tournament. St. Norbert's men's hockey program is one of the most successful of the last two decades, winning five National Championships since the 2007-08 season, including this past season when they captured the title with a dramatic 3-2 overtime win against Salve Regina in Lake Placid, NY. "I chose St. Norbert because it is a great school with an unbelievable hockey program that I think is a perfect fit for me," Cholak said. The Green Knights play in the National Collegiate Hockey Association (NCHA), of which they are two-time defending champs. They've faced off against Adrian College (which recently committed Bruins defenseman Matt Eller) in the conference championship each of the last four seasons. The campus is located in De Pere, Wisconsin, just south of Green Bay and about 150 miles up the Western shore of Lake Michigan from Cholak's hometown of Kenosha. "I grew up in Wisconsin and [St. Norbert] a beautiful campus. It will definitely be nice to be close to my family and loved ones," he said. Along with holding the franchise games played mark, Cholak ranks 4th all-time in points (106), 4th in assists (65), and 6th in goals (41). "Austin has been my home for the past three years and I could not be more thankful for the amazing people I have met there," added Cholak. "I want to say thank you to all the incredible fans that make every home game very special. I would also like to thank Coach Howard and Coach Rooney for helping me grow as a player and a person. Also, Coach Keenan Kelly, who has been my coach for three years. I have learned so much from him, and not only is he an amazing coach, but a role model to me."